Kenosha is Wisconsin's fourth largest city. It is in the state's southeast region. Many of its residents commute to jobs elsewhere, leading to its appellation as "Chicago's northernmost suburb." Typical sleepy Kenosha neighborhood in fall time. The city was founded in 1835 under the name of Pike. The town underwent growth and its name changed to Southport in 1837. In 1850 the name was changed again and this time it stuck: Kenosha. Even though it's been over a hundred years, you'll see many businesses use the Southport moniker in their branding. Kenosha owes much to the numerous waves of immigrants that chose to settle here. The Italians especially made an impact, along with the Germans, Irish, and others. Kenosha was heavily involved in the auto industry from the early 1900s to the late 1980s with Rambler, Nash, AMC, and others having factories in town. Kenosha became a sleepy suburb with not much in the way of "culture" once the factories left. Kenosha was hit hard by the loss of auto industry jobs like many cities in the rust belt. The downtown area is undergoing renovations to become more attractive with efforts that include: the removal of the previous dingy, abandoned warehouses with posh condos; the opening of three public museums; a recreation of the historical streetcar line; and several new art galleries. Land along the I-94 corridor has undergone extensive development, with warehouses and new factories moving in. Kenosha has also experienced a boom of chain retailers and restaurants opening recently, especially on the western side of town. Like the rings of a tree, the history of the city's growth is marked by the location and type of attractions in Kenosha. The downtown area has historic, brick buildings; the center of Kenosha is sleepy 1960s suburban with large, shady lawns; and the western edge is filled with McMansions and businesses. Influence from the students of the two universities, UW Parkside and Carthage, is reflected in the variety of trendy restaurants and bars in close proximity to the universities (northern Kenosha and near the lake). Kenosha's location between two major cities and along a highway means that there is plenty of shopping clustered around I94 and Green Bay Rd. The established, family owned restaurants and businesses are found in the more suburban center of the city. It is possible to bike from Chicago to Kenosha by following the Robert McClory bike path (roughly 56 miles of biking from the start of the trail into Kenosha). The trailhead starts in Highland park on Green Bay Trail at Laurel Ave. and St. Johns Ave./Sheridan Rd. It follows North Lakeshore drive and is clearly marked if you wish to start your journey further north. The path is mostly concrete, asphalt, or tightly packed limestone gravel. The trail follows the path of an old railroad. It is often tree lined and passes through some very pretty neighborhoods (and a few not-so-pretty ones as well). This is a dedicated bike path that only briefly goes onto streets around the Lake Forest area. It ends at the south side of Kenosha, by Anderson park. Give about 6 hours for travel, including rest stops. This is most likely a half-day event, minimum: ensure you find a good map of your route and pack enough supplies. Wisconsin Coach Lines. Service from Milwaukee, Racine, and O'Hare International Airport in Chicago. If coming from the north or south, I94 acts as a border to the western edge of Kenosha. If you are coming from Chicago or Milwaukee on I94, there are three main exits into the city: 344, 342, and 340. Exit 344 turns onto 75th street, the main artery of Kenosha. If coming from the west, Highway 50 continues east all the way into Kenosha. It cuts through Lake Geneva, turns into highway 83 for a short stint before Paddock Lake, and then becomes Highway 50 again. 42.585879-87.8258242 Metra, 5414 13th Ave. From Chicago's Ogilvie Transportation Center, you can take Metra's Union Pacific North Line into downtown Kenosha. There is paid parking near the train station if you wish to sleep in Kenosha and commute via train to Chicago during the day. This is the last stop on the line so departure and arrival times are limited. Ensure you check their most current schedule (found on the website) and plan your trip accordingly. Regular one-way fare from downtown Chicago for one adult is $7.50; an unlimited ride weekend pass only costs $7.. Most of Kenosha is suburbia. With the exception of the downtown area, attractions in Kenosha are spaced out with enough distance between them that walking or biking sometimes isn't an option unless you are very fit and have the extra time. You'll want to have some form of motorized transport to get around, unless you are staying near the lake and the attractions near the interstate or middle part of town don't interest you. Many of the streets are being redone to include bike lanes. Bike culture has not yet kept up with these new lanes and occasionally you will find cars driving in or overtaking from the dedicated lanes. Their connection to one another is sporadic because the lanes are added as streets are repaired. There are some things to keep in mind when navigating or receiving directions on Kenosha roads. Kenosha is a planned city: roads are laid out in a grid. Streets run east-west, avenues run north-south. Any road that deviates from these directions will be called a road, place, or circle; these are often named. All roads are numbered and the number increases the further south and west you travel. Addresses are created by taking the road's number that cuts across the road you are on (to the north if on an avenue and to the east if on a street) and appending the two digit house number. Odd numbered addresses are on the east side of avenues and south side of streets. This would be called the "odd" side of the road and the opposite side would be called the "even" side, to use the local parlance. Knowing your odds from your evens is important: there is alternate side parking city-wide from December 1st to April 1st, between 1AM and 6AM. If the day's date is an odd number you park on the "odd" side of the street and on the "even" side if the date is even. Alternate side parking is rigorously enforced. You will get ticketed if you park on the wrong side of the street during the winter months. Most locals omit the street or avenue designation of the road when giving directions, if they are referring to a main artery of the city. Of note is 75th (street), 60th (street) and 22nd (avenue) but this is by no means an exhaustive list. 75th and 50 (the street's highway designation) are often used interchangeably. Three roads are never referred to by their number designation: Pershing, Roosevelt, and Sheridan. The majority of car rental services are located on or very near 75th street. Taxi services in Kenosha are not nearly as useful as they are in larger cities. They often quote pick-up times of over a half hour, show up late, or don't show up at all. The situation is especially bad on the weekend. If you are drinking in Kenosha (a traditional and time-honored pastime), ensure you have a designated driver and do not rely on the taxi services. It is more recommended to use a ride-hailing app, such as Uber, if you do not have or are not renting a car. The Kenosha Streetcar is a two-mile streetcar loop serving downtown Kenosha, passing by the Metra station, Harbor Park, the Kenosha Public Museum, and other sites. The fare for the street car is $1 for an adult and 50 cents for children. The street car has different schedules depending on the season and day of the week. Between January third to February 28, the streetcar only runs on Weekends. On all weekends throughout the year, the street car runs between 10:05AM and 5:35PM. In March, the street car runs M-F 10:05AM-2:05PM. From April-January 2, the street car runs 11:05AM-6:35PM. There is no service on New Year's Day, Thanksgiving Day, and Christmas Day. Civil War Museum, 5400 First Avenue, ☎ +1 262 653-4140. Tu-Sa 9AM-5PM, Su noon-5PM. Despite Wisconsin's distance from the battlefields of the Civil War, Kenosha has a museum dedicated to it. The exhibits here focus on the experiences of Midwestern veterans of the Civil War. $7 adults, free for youth 15 and under if accompanied by a paying adult. Dinosaur Discovery Museum, 5608 Tenth Avenue, ☎ +1 262 653-4450. Tu-Su noon-5PM. Dinosaur museum which also houses the Carthage Institute of Paleontology. Free. Kenosha Public Museum, 5500 First Avenue, ☎ +1 262 653-4140. Tu-Sa 9AM-5PM, Su noon-5PM. Kenosha's natural sciences and fine arts museum. The lower level houses a large mammoth skeleton, small gift shop, and children's educational room. The upper level houses a taxidermy menagerie and an art gallery. Free. Kenosha is a city filled with trees. Nearly every street is lined with old growth oak and maple trees. From around mid September to early November, Kenosha is painted with strokes of red, yellow, purple and orange as the leaves change colors. It's an excellent time of year walk around the suburbs or down by the lake to take pictures and enjoy the fall colors. Visiting Petrifying Springs Park is a popular event on fall weekends for families to take pictures with a scenic background. Chain retail shopping can be found near exit 344 on I94, down the entire stretch of 75th, and clustered around the intersection of 75th and Green Bay road. The more established, mom-and-pop shopping locations are found sporadically throughout the city and in the downtown area. If they sell burgers they probably sell fried cheese curds, a Wisconsin delicacy. If you're not interested in expanding your palate with local food, rest assured that the city has the usual chain restaurants, including Applebees, Chili's, Red Robin, and Culvers. A heavy concentration of chain restaurants can be found on 75th street, about a two miles to the east of I94 (between 104th avenue and Green Bay road). Just drive up and down 75th until you see something you like. The best way of enjoying your stay in Kenosha is to try one of the local, family owned restaurants. Kenosha was founded by successive waves of English, German, Scandinavian, Irish, Italian and Eastern European immigrants. Thus, its culinary institutions are quite diverse. There is also a high saturation of bars in Kenosha and many of these serve food far above the usual bar-pizza food. There is a smoking ordinance in effect which prohibits smoking in restaurants and bars unless they have a completely segregated smoking room with separate ventilation. You'll have difficulty finding a restaurant or bar that has spent the extra space to accommodate a separate smoking section, however. Pizza in this area has a thin crust and is cut into squares. Kenosha is spoiled with its selection of pizzerias. Common Kenosha pizza is made with a thin, cracker-like crust and served in squares, in contrast to the deep-dish style Chicago is known for. 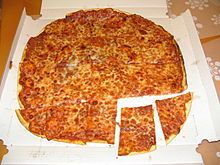 Most locations also offer thicker crusts (commonly referred to as "double dough") and deep dish. Don't ask the locals what the best pizza place is since you will get a different answer each time. Every Kenoshan has a favorite and will fiercely defend it when it's time to order. It's better to ask what isn't a good place for pizza; the answer will be more consistent and have fewer entries. Kenosha has many bars. There is usually one on the corner roughly every couple of blocks or so. Most of these are hole-in-wall places that you'd only step foot in if you lived in the area or went with someone who was a regular. There are locations listed in the Eat section that legally are bars but their food is a main attraction. This includes the Brat Stop, Captain Mike's, Mike's Chicken and Doughnuts, and Ashling by the Lough, among others. Below are bars that don't serve food or where food is not the main attraction. A high concentration of chain hotels and motels can be found near I94, specifically near exit 344. These accommodations are pretty "vanilla" and budget to mid-range. Best Western Executive Inn, 7220 122nd Avenue, ☎ +1 262 857-7699, toll-free: +1-800-438-3932, fax: +1 262 857-2698. Wyndham Garden Harborside Inn & Kenosha Conference Center, 5125 6th Avenue, ☎ +1 262 658-3281, fax: +1 262 658-3420. The hotel is considered quite nice by local standards. It has a beautiful view of the harbor and Lake Michigan. It's located in the middle of the downtown area and within a ten minute or less walk to most of the downtown restaurants and museums listed here. It's close enough to the train station that it would be feasible to stay here, be entertained and fed, and visit Chicago without needing a car (this is all something that can't be said for many other locations in the city). Other than that, it's just ok, a stay here isn't going to wow you. The rooms are mildly dated but clean. It has a pool and a gym. Some rooms allow pets. All rooms are non-smoking. You are unlikely to become the target of a crime, as most crime is locally focused. While nowhere near south Chicago levels, certain areas near the train tracks in the inner-east part of Kenosha are rather rough. You won't need to make sure your car doors are locked when approaching a stop sign or roll through red lights at night, but don't dawdle around the area after sundown. Kenosha's downtown has been cleaned up in the past decade, but portions of it beyond the main strip should be avoided after night. Also, the downtown area has a high homeless population. They ride the trains from Chicago, and Kenosha is the last stop on the line. They are mostly harmless. Avoid staying in motels on Sheridan road on the north side of Kenosha. In addition to being very run down and shady, there is frequent drug-related crime, car break-ins, and the occasional prostitution bust. It isn't an incredibly rough area, especially compared to the inner-east part of Kenosha, but the area has a large number of motels within 1,000 feet of the lakeshore that offer very cheap prices and so could, at a glance, seem like a good place to stay. You are more likely to get into a car accident than become the target of crime. You shouldn't speed, but local Kenoshians have a tendency to drive at least 5 miles per hour over the speed limit, even in the city, due to its proximity to Chicago and I94's driving habits. They consider it a speed minimum limit, not a maximum limit. If you do the speed limit on the main north-south roads, you might have some road rage directed at you. Just remain calm and stay in the rightmost lane. Most cops won't pull you over even when you are speeding next to them if you're keeping up with traffic and your license plate is from Wisconsin. Just outside of Kenosha County, there are often speed traps on I94, Green Bay Road, and Sheridan. You should especially not speed at night since Kenosha has a drunk driving problem and the traffic lights switch to flashing mode late at night which seems to mean "green light" instead of "stop sign" and "yield sign" to the idiots even when your direction has right-of-way. Football in Wisconsin is a big deal. Kenosha lays directly on the border of "Bear" country. This city holds a significantly higher percentage of Bears fans in an otherwise Packer saturated state. If you want to make (and keep) friends, approach all topics of football in a lighthearted and jovial manner. Light ribbing and taunting is expected between fans of these two rival teams, so don't take it personally. If you are a Vikings fan, keep it to yourself. Avoid a common faux pas: if you eat at one of the drive-ins in Kenosha, turn your lights off when you pull in. Turn your lights back on when you are ready to leave and want the server to bring your bill. The arrangement of the parking lots also means that your lights might be shining into someone else's car while they are trying to eat or into a neighbor's window. The locals will know you are a drive-in newbie if you leave your lights on while you eat. The staff are too polite to tell you this, it's something locals have learned from their parents and their grandparents. There are no internet cafes in Kenosha. If you need internet, most restaurants have free Wi-Fi and only some require a purchase be made. Kenosha has its own newspaper: The Kenosha News. It can be a good source of finding information about special events or festivals occurring during your stay. Newspaper dispensers can be found at most gas stations, grocery stores, and in front of fast food restaurants. Happenings magazine (which is free) can be found in the entryway of most non-chain restaurants in the city. This small pamphlet like magazine focuses on local festivals, seasonal special events, and various gossip. It's still worth a look even if you aren't interested in the gossip because it gives a calendar of events in each issue and is a good additional resource to find things to see and do that might not be annual occurrences that can be listed here. Racine - a large city to the north of Kenosha that has a decent shopping and downtown area. Lake Geneva (Wisconsin) - a touristy resort town with quaint boutique shopping and summer events. Milwaukee - a city known for motorcycles, beer, and festivals. Chicago - a large city filled with diverse culture, museums, pizza, skyscrapers, shopping, and more. This city travel guide to Kenosha has guide status. It has a variety of good, quality information including hotels, restaurants, attractions and travel details. Please contribute and help us make it a star! This travel guide page was last edited at 08:36, on 14 January 2019 by Wikivoyage user Traveler100bot. Based on work by Wikivoyage users Ground Zero, Alistair1978, ויקיג'אנקי, DethDestroyerOfWords, Wrh2Bot, MSG17, Ikan Kekek, Swissarmysalad and MartinJacobson and others.